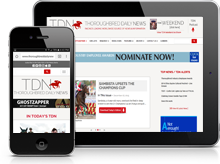 When you go all the way to France to buy a 2-year-old who is by War Front out of a Sadler’s Wells mare, you might have dreams of winning the GI Belmont Derby, the GI Secretariat S. or a Breeders’ Cup race on the turf. But the GI Kentucky Derby? That didn’t cross Mark Casse’s mind when War of Will (War Front) showed up at his barn after being purchased by his brother Justin last year at the Arqana May 2-Year-Old Breeze Up Sale. Why would it? On behalf of client Gary Barber, Justin Casse paid the equivalent of $298,550 for a horse whose pedigree, when it comes to grass racing, is as good as it gets. War of Will had previously RNA’d as a yearling at Keeneland September for $175,000. Casse did what any trainer would have done with a horse with that sort of pedigree. He plotted out a grass campaign, and he came away without a single win. War of Will did run second in the GI Summer S. at Woodbine, but, after finishing fifth in the GI Breeders’ Cup Juvenile Turf, his career record stood at 0-for-4. War of Will was hardly a bust on the grass, but he now has a new lease on life, and in the last place you’d expect it–in dirt races. He won his first career race in a Nov. 24 maiden special weight run over a sloppy main track at Churchill Downs. With Tyler Gaffalione aboard, he drew off to win by five. Casse and Barber were so impressed that they immediately started to plot a route to the Kentucky Derby. A much more important test came last Saturday. Stepping into stakes company and facing off against 11 challengers, he romped in the GIII Lecomte S. at the Fair Grounds, winning by four lengths. That made this son of War Front 0-for-4 on the turf and 2-for-2 on the dirt. Casse said he and Barber considered going on the dirt in the GI Breeders’ Cup Juvenile, but that didn’t seem like a logical spot to try the dirt for the first time. Once the Breeders’ Cup was over, Casse couldn’t get the horse on the dirt quick enough. He will, of course, remain on the dirt for now, and his next start will come in the GII Risen Star S. Feb. 16. War of Will is not the first War Front to have success on the dirt, but it is less common. 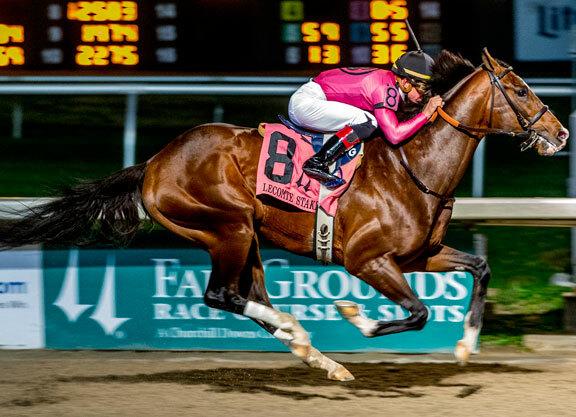 The Factor (War Front) won four stakes on the dirt, including the GI Malibu S. Departing (War Front) won the GII West Virginia Derby, the GII Super Derby and the GIII Illinois Derby, all on the dirt. But War Front is best know for his ability to produce stars on the grass. Throw in that War of Will’s dam, Visions of Clarity (IRE), never raced on the dirt and it’s hard to explain why this particular colt has prospered on the dirt. Then again, it’s breeding, an inexact science. After being among those who hyped Coliseum (Tapit) after he broke his maiden only to watch him run sixth in the GIII Sham S., I ought to remember that trainer Bob Baffert is, well, human. But it’s pretty hard not be excited about the debut of Dessman (Union Rags) in Saturday’s seventh race at Santa Anita. With Flavien Prat, who doesn’t ride that often for Baffert, aboard, Dessman whipped a field of maidens to win by 7 1/2 lengths. Once upon a time, the fact that he did not race as a 2-year-old might have discouraged some when it comes to his Kentucky Derby chances, but as memory serves me, didn’t Baffert just win the Triple Crown with a horse that didn’t race at two? The bottomless well of 3-year-old talent in this guy’s barn never ceases to amaze. Largely because sprinters don’t get the sort of fanfare that routers do, Roy H (More Than Ready) might just be one of the most underrated horses in years. Now seven years old, he kicked off his 2019 campaign with a four-length win in the GII Palos Verdes S. Saturday at Santa Anita. His next stop will be Dubai for the G1 Dubai Golden Shaheen. Before he departs, trainer Peter Miller and owner Rockingham Ranch will pick up their second straight Eclipse Award as Roy H will be named 2018 champion sprinter. He will be a repeat winner. The last horse to do that in the sprint category was Housebuster in 1991 and 1990. Based on the way he ran Saturday, there’s no reason why Roy H. can’t win a third straight Eclipse Award this year–something no horse has done since Zenyatta, who won the Older Filly & Mare title in 2008, 2009 and 2010.